C.W.W. Kannangara team Back row: (from left) Sandaru Manumal, Mayantha Pramod, Manuja Shehan, Gihan Thashintha, Nivantha Samarasinghe, Oshan Madushanka. 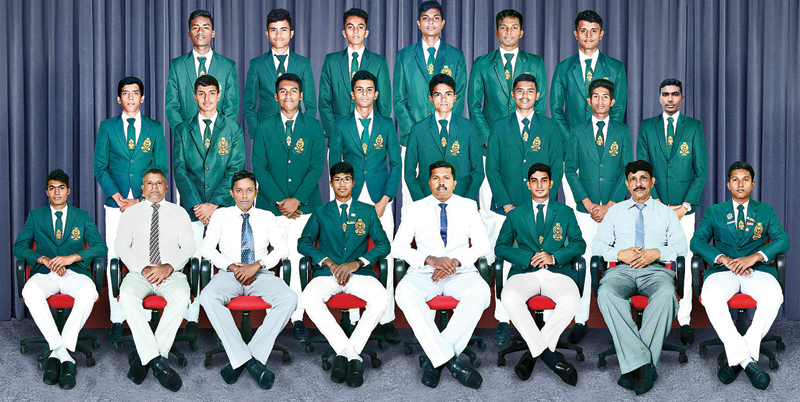 Middle row: (from left) Ushan Maheepala, Dinul Samuditha, Chamod Dilshan, Kaveesh Akalanka, Uvindu Harshika, Rumesh Madusha, Sakun Vikasitha. 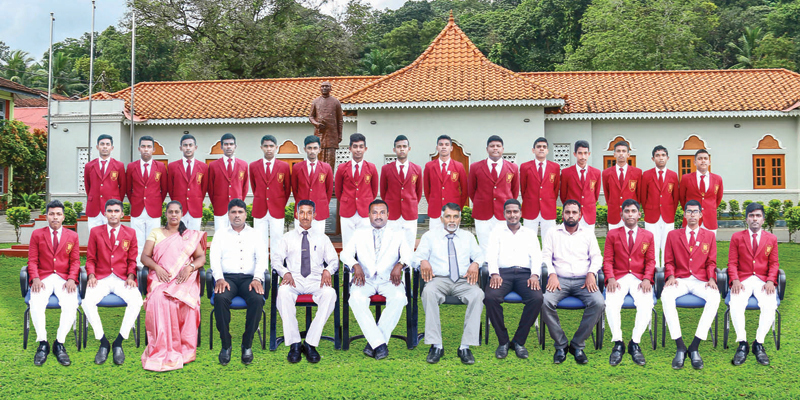 First row: (from left) Vishma Nayanthara, Saman Amugoda (Coach), Chanaka Ihalahewa (MIC), Kavindu Dewmina (captain), Susantha Weerasinghe (Principal), Nishad Chamuditha (vice captain), Hemantha Gunaratne (Deputy Principal) and Lasindu Shehan. The third annual ‘Battle of the Raigam Pasdun’ cricket encounter between Sri Palee College, Horana and C. W. W. Kannangara Vidyalaya, Matugama will be worked off at Public Grounds, Matugama on April 5 and 6. This year the hosts are C.W.W. Kannangara Vidyalaya and all the aspects of the Big Match will be carried out by the Past Pupils of the school. These two schools have not recorded a victory in the series but they expect to register a victory this year. C.W.W. Kannangara team will be captained by fourth year coloursman Kavindu Dewmina and Nishad Chamuditha will be his deputy. Sri Palee team will be led by Isuru Pathum while last year’s captain Suresh Kaushan will be give his fullest support as vice captain this year. C.W.W. Kannangara Vidyalaya recorded four outright wins out of nine games in their school cricket season against Pothuwila Vidyalaya - Payagala, Velapura Vidyalaya – Kalutara, Vidyaloka Vidyalaya – Galle and De La Salle College – Mutwal. Also they gained three first innings wins against Ananda Sastralaya – Matugama, Mahanama Vidyalaya – Panadura and St. Thomas College – Kotte. Sri Palee team recorded one outright win and a first innings win against Pagnananda Vidyalaya, Kotawila and Ananda Sastralaya, Kotte in six matches. Skipper Kavindu Dewmina of Kannangara Vidyalaya has scored 550 runs including a century and four half centuries while his deputy all rounder Nishad Chamuditha has got 250 runs and claimed over 50 wickets this season. Another centurian of the team all rounder Lasindu Shehan has contributed 375 runs and bagged over 45 wickets. Vice Captain Suresh Kaushan will be the key player of Sri Palee team who has scored 340 runs with a half century while Skipper Isura Pathum and Sayuru Sandun will play a major role in the encounter. Dinuka Anupamal who has taken 54 wickets will open the bowling attack and Chamath Chamupathi an experienced player who has been unable to make any impression this season will be the mainstay in their bowling department. The two principals M. D. Jayasiri of Sri Palee College and Susantha Weerasinghe of C. W. W. Kannangara Vidyalaya expect a good game with a high standard of discipline throughout the two days from the players and spectators.